Betcha Bruce Wayne wears this. High-quality tie bar based on Batman! Featuring the Dark Knight's iconic black-and-yellow logo. Show your love for DC Comics! 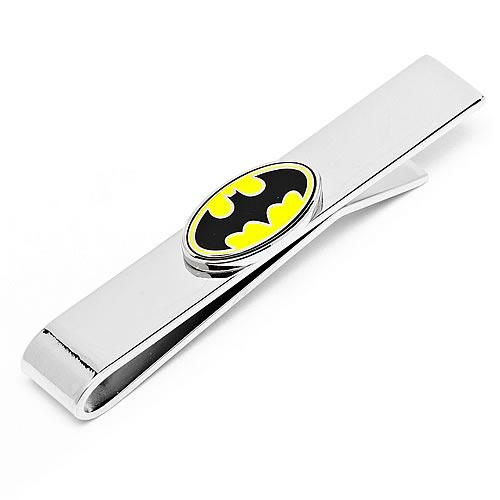 Show your love for DC Comics with this high-quality Batman Logo DC Comics Tie Bar! It's the perfect way to subtly style your geekdom in a classy and reserved manner appropriate for any upscale event. With this tie bar, you can show everyone how much you love Batman, and also sport formal-wear jewelry that features the Dark Knight's iconic black-and-yellow logo! Betcha Bruce Wayne wears this. Crafted with enamel and silver plating. The Tie Bar measures about 2-inches long x 3/8-inch wide.